Dad with a nice Muskegon river “smally”. 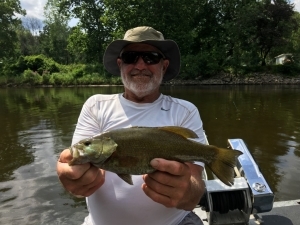 The Muskegon river fishing report for July 9, 2018 in the Newaygo, Michigan area is about the “dog days” of summer being upon us !….and what a GREAT time for fish for ‘ol bronzeback – a.k.a.- Smallmouth Bass ! With both fly fishing and light spin tackle equipment, we’re fishing for not only Smallmouth, but depending on what section of river or even river itself, Northern Pike and even some Walleye here and there. Due to how the different impoundments between each dam on the Muskegon river change throughout the summer, we may be fishing Hardy dam water one day, then Rogers dam the next. Water levels often dictate what sections are accessible in low water summer conditions, so it can be a juggling act of sorts. Not to be left out come this time of the year is fishing the Grand river in or around the Grand Rapids area, or also sections east of Grand Rapids and again, it’s water level dependent. Morning and evening times are proving to the best fish catching times of the day, but that doesn’t mean they won’t bite mid day. It can be a matter of how much recreational traffic is on the river during any given time, that will either help of hinder the “bite”. Click HERE to read an article on summer fishing on the Muskegon river. Present water temperature of the Muskegon river around the Newaygo area is in the 67-68 degree range, a bit warmer down stream and also warmer in each of the impoundments upstream from each dam. Click HERE for current river conditions.